Third-grade student sends over $1,500 to Texas Diaper Bank - The Resident Community News Group, Inc. | The Resident Community News Group, Inc.
Mattie Sacks peers over a pile of chocolate chip cookies and thank-you notes. 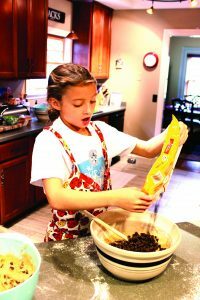 Mattie Sacks, a third-grade student at Hendricks Avenue Elementary School, put her love for baking to philanthropic use last month. The San Marco resident raised more than $750 for the Texas Diaper Bank for Hurricane Harvey relief selling chocolate chip cookies. “She wanted to give to the diaper bank because we have one-year-old twins, and she said if we had to evacuate we would need a lot of diapers,” said her mother, Meg Sacks. Mattie also made cookies out of construction paper with felt chocolate chips as thank-you cards for those who donated but wanted a “virtual” cookie instead for dietary or distance reasons. She received a lot of long distance donations. Mattie Sacks mixes cookies to sell for hurricane relief. After making and individually wrapping about 250 cookies using the Nestlé® Toll House® chocolate chip cookie recipe, Mattie then delivered them all around town. Mattie’s dentist, Dr. Jila Mahajan at Kid’s First Dentistry at Roosevelt Square Mall, plans to match the donation, sending over $1,500 to the diaper bank.